This free coloring sheet and activity page was sent in by Matt from ArtistXero Creations. His website sells digital coloring sheet download, but he wanted to share a sample here for our readers. We hope you enjoy this resource. If you want more, you can buy the whole set on his website. 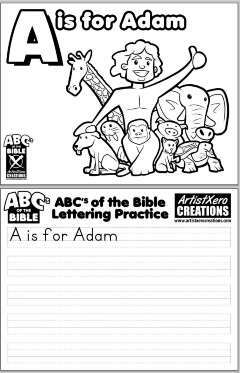 Besides the ABCs of the Bible series, he has many more coloring sheets for different Bible characters. For more of his artwork, you might enjoy the Saga of Samuel. Our best ideas often come from readers. Click here to learn how you can help others through our website. All content is carefully screened by our editors for theological and educational quality. Tony Kummer (Editor) reviewed & updated this page on : September 12, 2014 at 9:34 am. All our content is peer reviewed by our readers, simply leave a comment on any post suggest an update.